One of my favorite things about Cabo is that the people are always looking for a reason celebrate. That’s why when the 4th of July rolls around each year, the bars and restaurants open their arms to the foreign holiday. While it might seem controversial to celebrate another country’s holiday, the 4th of July in Cabo becomes simply another excuse to have a good time. With a large ex-pat community from the States and plenty of visitors, the idea of starting up the grill, exploding fireworks and decorating with red, white and blue is a no-brainer. It’s fun! Here are some places where you can join in the 4th of July fun! If you’ve never been to El Farallon, it’s worth the visit. It’s through the tunnel at Capella Pedregal and the restaurant is carved into the mountain. 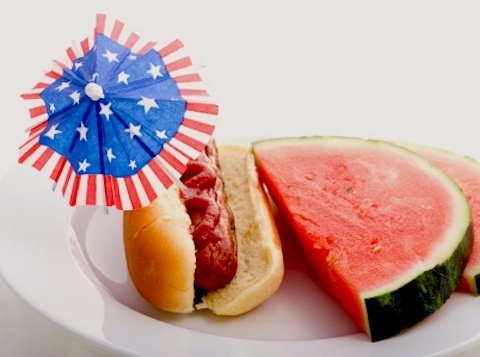 They will serving up watermelon, hot dogs, hamburgers and even cole slaw. Desert options include a warm apple tart. Event is from 6pm – 10pm. It’s not the typical pool party with the neighbors; it’s much cooler. There will be live performances, gogo dancers and body paint. You can watch the fireworks on the beach at 10pm. You can also arrange for VIP bottle service. Pool Party starts at 12pm. No Cover. Mango Deck is known for its ability to get the crowd going and I’m sure that the 4th of July will be no different. For $25 you get an all you can eat BBQ buffet, lots of entertainment and a great view for fireworks. Party starts at 6pm. Most hotels on Medano will have have their own celebrations and you will definitely see fireworks. Bars like Squid Roe and Baja Junkie will be celebrating the holiday in red, white and blue style. Look for 2×1 specials and other goodies. My favorite thing about the 4th of July is fireworks. What’s yours?